Rathlin O'Birne island is a Donegal island situated off the very tip of the cliffs of Sliabh Liag (Slieve League) on the south west coast of Donegal. 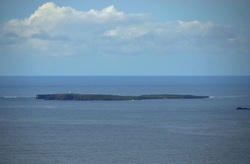 The island is unihabited and has a lighthouse on it. The lighthouse was Ireland's first nuclear powered lighthouse. It is thought that St. Asicus, St. Patrick's coppersmith, spent time there prior to being found by his monks somewhere on the cliffs of Sliabh Liagh. Assicus himself in shame because of a lie told either by him, or, as others say, of him, fled into Donegal, and for seven years abode in the island of Rathlin O'Birne. Then his monks sought him out, and after much labour found him in the mountain glens, and tried to bring him home to his own monastery at Elphin. But he fell sick by the way and died with them in the wilderness. So they buried the venerable old man in the churchyard of Rath Cunga, now Racoon, in the Barony of Tirhugh, County Donegal. The old churchyard is there still, though now disused, on the summit of a round hillock close to the left of the road from Ballyshannon to Donegal, about a mile to the south of the village of Ballintra. We sought in vain for any trace of an inscribed stone in the old churchyard. He fled from men during life, and, like Moses, his grave is hidden from them in death." Read more about St. Assicus and view photos of his grave HERE.